If you think about the way we have digital banking and web presence structured today, it is actually wrong. Most banks today already have a well developed ‘public’ presence in the form of www site, and a separate ‘secure’ portal as a transaction or services platform “behind the login” – normally called “Internet Banking”. The problem is, that this basic structure is not the optimal configuration for customers, nor for the bank moving forward. Largely the reason for separating public website and internet banking comes down to historical elements. The major driver is purely evolution of two separate platforms. While there had been early attempts at some sort of transactional platform for banking through dedicated networks, these largely failed until the internet provided a common infrastructure for simple online access to services. While transactional banking was an obvious fit to the IP world, when the internet emerged commercially it was more about brochureware – and thus the content was less about functionality and more about marketing and sales. Thus emerged two disparate platforms – one was functional or transactional technology, and the other was about revenue and sales. Traditionally speaking the “dot com” presence was owned by the marketing, or in some misguided cases corporate communications who mistook the home page as a staging ground for press releases and investor relations messages. Internet Banking, however, being largely about a front-end to transactional services (such as viewing a statement, getting account balances, transferring funds and paying bills) was driven by the IT teams who were in charge of integrating the browser with the bank core systems through some sort of middleware. To this day, these teams just don’t understand each other, so the hope that one day public and secure web presence could work together, is hard to visualize. The problem with these two separate views of the world, is that it no longer makes sense for the customer. 90% of daily traffic to most bank website goes to the login button, so conceivably your most attractive targets (i.e. existing customers) are ignoring all of the marketing spend on nice sales messages, flashy graphics and landing pages, and they’re going straight through to the tasks they want to complete behind the login. Behind the login, most banks adopt a quite sterile marketing environment, with very limited sales communications, largely focusing on execution. The fact is, based on these analytics, you probably need to be spending at least 90 per cent of your Web marketing budget on building offers and campaigns for existing customers through the Internet banking secure portal, but the IT guys don’t get any of that. The core advantage to selling behind the login is that the acquisition process is dead easy. You already have all the customer information (KYC), so compliance is simply a click-based existing customer acquisition, rather than copious forms or entry to provide proof of who they are, their credit risk assessment, etc. These are simply the easiest customers to convert. The future of using IP to connect with customers is understanding that there isn’t and shouldn’t be two separate web-based platforms. The fact is that if you think about content I need everyday from the bank, stuff like my account balance, my transaction history, upcoming payments, etc – this probably doesn’t need to be subject to a full-blown, two-factor authentication model. In most cases, this information could be shown contextually into my banking experience just based on a cookie and ‘remember me’ authentication model (think hotmail.com or facebook). Marketing journeys could start one of two ways. For example, if I come to your site as a result of a search on mortgages, the homepage needs to respond to your interest in mortgage immediately, along with recognizing if you are an existing customer. For example, if you are an existing customer, you’d see immediately what you are pre-approved for, or if you are an existing mortgage customer then you might see a refinancing option or a competitive offer for bundled home insurance. Much of the content we need is going to be contextual too. So I need you to tell me my credit card balance when I’m on a third-party credit card site, about to use my card, instead of just refusing the transaction because I’m over the limit. I need you to start getting me offers for products and services when and where I need them, not waiting for me to come back to the site or a branch. I need to have a place I can go which centralizes this relationship and defines when and how we can work together, what communications I receive from you, and a place where I have a tailored view of my footprint with the bank, etc. Execution – The day-to-day functional stuff such as transferring money, paying bills, etc. 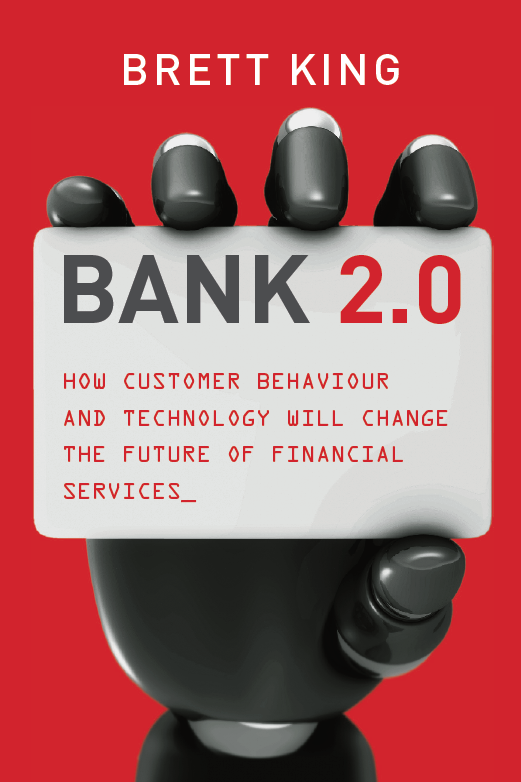 Since the introduction of internet banking, customer behavior as respects day-to-day banking has been rapidly changing. Whereas in the mid-80s you might have done 70% of your banking through the branch, cash and cheque, today most of our retail banking interactions occur through electronic channels. For some segments, like seniors passbook holders in Hong Kong, pensioners in the US, and SMEs in Indonesia and India. But increasingly, while branch is still being used, it is not being used as the preferred method of banking by the majority of customers today. The American Banker’s Association have been tracking this shift for some time. While 21% of customers in 2009 still cited the Branch as their preferred method, 25% chose the internet. The more telling statistic is that the branch as the preferred method has gone from 36% to 21% in just 3 years – that is a decline of 41% in 3 years for the branch as the ‘preferred’ method of banking. With mobile internet banking adoption skyrocketing, cheque usage in question, we can expect this rapid decline to continue over the next 3-5 years. The fact that in some markets branch visits have increased, is not a significant statistic considering the rate at which they have increased in comparison to utilization of direct channels. HSBC has found that 45% of their Premier customer base (their high-value, preferred-banking retail segment) in Hong Kong were online and using Internet banking on average 10 times per month. Between 2002 and 2007 Internet Banking grew 174% in the UK. In Japan over 2/3rds of consumers use Internet Banking regularly according to a survey by gooResearch in February of this year (some of the data is translated here). 38% of the survey group reported using Internet banking more than 3-5 times per month (about 6% said more than 10 visits per month), and and about 22% of the sample size reported using mobile phone based banking more than 3-5 times per month. Nielsen have found even more significant results in markets like Australia and New Zealand. Research suggests the #1 driving force behind this increasing adoption of internet and mobile, regardless of geography, segment or market, is the convenience factor. It’s just too easy to log on to your bank as compared with driving down, finding a parking spot and standing in line at the branch. For most banks their IT systems still record the customer as being ‘allocated’ or ‘attached’ to a branch. This is most likely the branch you first visited to sign up for your account. If you’ve moved City or location and you visited a new branch and asked for you account to be moved over to that branch, it has changed. But for most banks you are ‘owned’ by a single branch as a business unit. Thus when a personal loan is applied for online, or you deposit money in a fixed income account, many banks record this as a ‘sale’ for the branch you are attached to regardless of which channel it came through. On many occasions you can’t actually complete the application for certain products online. There are various reasons for this. For a mortgage product, for example, a bank might want to cite documents associated with the land purchase. For investment products ‘that carry risk’ you need to sign a document to show the regulator that you weren’t coerced into making an investment and that you understand the risk. So while 90% of the leads today for new mortgage product might come through the internet or call centre, the final sale is still recorded against a ‘branch’ because that is where you did the last piece of the compliance process. Despite the increasing adoption rates, the increased usage of the internet channel by customers, the flagging branch usage, and the increasing revenue through online channels, most banks still consider the internet as an alternative to the branch or as a cost-reduction strategy for transactional banking. The branch is seen as the premier sales channel for customers – and it is. But it just isn’t the only channel for sales. If banks honestly supported the internet as a sales channel, measured existing sales with better granularity as to where the revenue actual came from and used customer behavior as a leading indicator of where the money should be spent – our online and mobile banking experience would be far better than it is. For now, most bankers are still perpetuating a system that rewards physical distribution networks over direct channels because they are out of step with customers. Today the branch is an alternative choice for the majority of customers. The branch, while retaining a role as a premier sales engagement channel, is still day-to-day a secondary choice. With the rapid rate of mobile banking adoption we can expect the role of the branch to be further diminished as part of customers day-to-day banking needs. When we get an accurate picture of sources of revenue, many branches will no longer be viable from a business case perspective – at the very least they will have to change form and function. As banks realize that behavioral shift can not be arrested and real revenue is suffering due to lack of support, we will start to see a land grab for better positioning of product online, through mobile, through other direct channels, third-parties and partners. This means straight-thru-processing, automated credit risk assessment and better offer management through electronic channels becomes absolutely critical. The organization structure needs to change too; Branch can’t dominate strategy, products must be manufactured for all channels, and compliance needs to find better ways of digital enablement. As I’m speaking to more and more banks about BANK 2.0 a glaring realization is coming together. I think this has to be a core role with the bank moving forward – why? Because this is what someone needs to tell management for them to get it right. Right now today I believe that in most developed economies if we properly measured Internet as a channel we’d find that it contributes on a par with Branches in respect to revenue. Internet is the primary day-to-day channel for almost half the retail bank’s customers today. My argument is as follows. Let’s take a product like mortgages – in the USA, UK, Hong Kong, Singapore, Australia, Malaysia or similar with 70-75% internet penetration. Most people would be doing their primary product research on the web before committing to a mortgage. In some cases they might actually apply online, but even if they don’t apply online they are still doing the bulk of their research online then they’d call to make an appointment or use an online enquiry form, etc. The key component of the sales process has really happened outside the branch (i.e. the ‘hook’), but in the end it’s likely that a bunch of sales get recorded as ‘branch’ revenue when actually the lead was generated online. Same with credit cards, life insurance, etc. Now, internally as a bank we tend to have revenue as a key measure because it directly effects profit and therefore EPS (Earnings per share). What we look from a financial metrics perspective is what Branch A, Product B and Direct Channel C did month-on-month as a comparison of relative performance over time. We look at revenue for product as a whole, we look revenue for the channel as a whole, but I don’t believe banks generally have a clear picture of how customers engage for a product ‘journey’ and where the revenue is really coming from. Additionally, we probably have a fair idea on transaction traffic per channel, but do we know how that traffic has changed over the last 2-3 years? What is the pattern? Can we predict more accurately where customers will be going in the future. The fact that we’re recording product revenue like mortgage, cards, life policies as ‘branch’ or inbound ‘call centre’ revenue when the lead and initial engagement was likely through the online channel, this results in skewed operational budgets, management strategy, etc. Revenue alone is a poor reflection of the actual customer engagement with the bank from a channel perspective. What we need to do is inform bank strategy. To understand how to engage customers more efficiently, we need to know what they are doing holistically, not just channel by channel separately. This will better inform organizational strategy, marketing, etc. What triggers a mortgage buy? Normally the initial trigger is when someone finds a property they want to buy. So they have two or three potential contact points before they engage with the bank on a mortgage – a real estate agent, a real estate website and a developer. Then we know that a customer engages with a bank. They’ll probably go to their own bank first, but if they have multiple bank relationships, they’ll make an enquiry through each. How do they do it? They’ll either ring the call centre, walk into a branch, or go online. Since 2002-2003 that the number of leads that have come through internet and call centre have been increasing relative to branch. This is a trend we need to know about because it tells us where customer behavior is going and where we need to support the customer engagement most efficiently to secure their business. It’s hard to predict when a customer is going to need a mortgage, but we do know that when they are ready to ‘apply’ our ability to close that customer depends on three things, approval time, rate or how competitive the proposition is, and how easy it is to engage with your bank on that product. Measuring how much revenue we did on mortgage product through Channel A or Channel B and how much it increased from Q409 to Q110 doesn’t help the bank understand effectiveness in engaging the customer through the journey. Revenue could be a function of economic conditions, housing supply and demand, etc. So revenue management doesn’t necessarily inform the bank from a strategic perspective. However, if we know at which points of the journey the customer used which channel, and how that pattern of engagement is changing over time, then we have a winner. This can help Banks more accurately target marketing/media buy, it can help us figure out which partners (real estate, developers, etc) to be targeting, it can help Banks optimize channel experience where it most matters, etc. 4. Help inform marketing and media buy strategy where dollar spend will be most effective (this in itself will help reform marketing too). We all recognize that a total channel, total relationship, total profitability view of the customer is essential moving forward for retail banking. So the question becomes how to collate that data organizationally. Until you lift the hood and see all this data, then it’s just too hard to really know where revenue lies.